A decision on 525 new homes in Angmering has been delayed as a planning application was pulled from a committee agenda this week. Developers Rydon and Gleeson want planning permission for land north of Water Lane with one access using the existing route to the motor racing circuit and the second from Dapper’s Lane. The scheme includes 30 per cent affordable housing, employment land, play areas and informal open space. 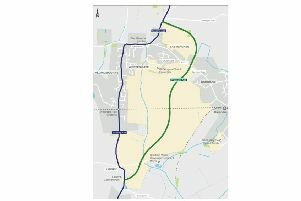 The outline application was due to be discussed by Arun District Council’s development control committee on Wednesday January 23, with officers recommending approval, subject to conditions. However the plans were pulled from the committee’s agenda and will be debated at a later date. The development is separate from another scheme for 175 home south of Water Lane, which was supported by the committee back in November.